What Does It Mean When An Equation Has No Solution? Sometimes equations have no solution. This means that no matter what value is plugged in for the variable, you will ALWAYS get a contradiction. Watch this tutorial and learn what it takes for an equation to have no solution. How Do You Graph a System of Equations With No Solution? 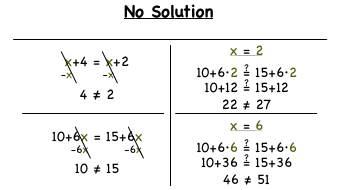 There are many different ways to solve a system of linear equations. In this tutorial, you'll see how to solve a system of linear equations by graphing both lines and finding their intersection. Take a look! How Do You Solve an Equation with No Solution? Trying to solve an equation with variables on both sides of the equation? Figure out how to get those variables together and solve the equation with this tutorial! Surprise! Turns out, this equation has no solution. Check out this tutorial and see why!